Everyone knows that riding the bus, or taking the (sky)train, or taking any form of public transit is the most cost effective way to get around. Or is it? Motorcycling can be a cost-effective way to get you where you need to go in record time. There are a long list of pros and cons on taking transit and riding a motorcycle. Which is best depends on what is right for you. The average commute in Vancouver is 67 minutes (the global average is 64.2 minutes*). If you work a five-day work week that means you lose 5 hours every week or 20 hours a month to commuting. That’s no small amount. We know that commute times vary by mode of transportation: if your commute is 60 minutes via transit then you could get it down to 30 via motorcycle (or car). So really the bus is costing you 30 minutes your day. How much is this time worth to you? Most people do not put value on their time, but if you have a family or you’re an incredibly productive person. It’s definitely in your best interest to spend less time on a bus. So what is the cost difference between taking public transit and motorcycling? Depending on how many transit zones you travel through your pass will cost between $90 and $200 per month. The costs of motorcycling vary even more. A small engine motorcycle (125ccs to 400ccs) can cost you between $2,000 and $10,000 to buy. Insuring it depends on your personal insurance rate, but the average cost is about $50 per month for basic and liability insurance. Your gas cost depends on the length of your commute. Given that small cc bikes are great on gas let’s call this $50 per month or less. You will have to maintain your motorcycle, but the good news is a smaller engine motorcycle are easy on the wallet. Especially if you buy a Japanese brand (Honda, Kawasaki, Yamaha). Parking your motorcycle could result in additional costs. Overall if you are very cost effective in terms of running and parking your motorcycle. Costs of riding can be very close to the cost of taking transit. 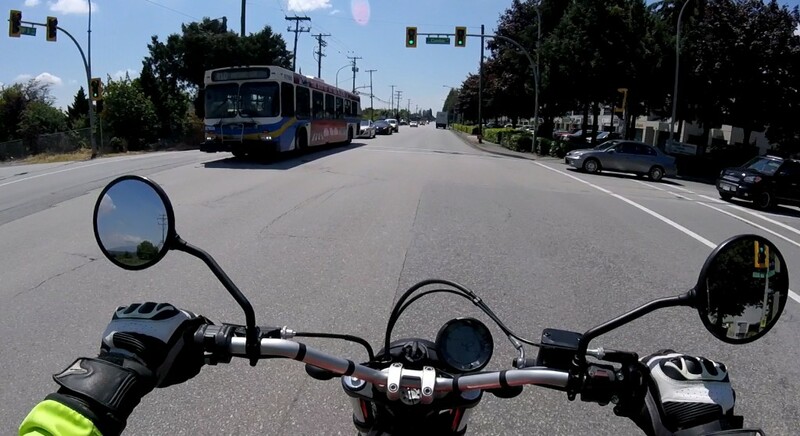 Although public transit comes with some risks motorcycling definitely carries more risk. Interestingly, neither buses nor bikes have seat belts. Buses have escaped the seat belt law over the years because their design and accident/injury stats don’t warrant it. Motorcycles would be significantly more dangerous to the rider if they had seat belts. You don’t want to be attached to your motorcycle if you crash. When you are riding the bus, you have the protection of the bus around you. On a motorcycle, your relative safety depends on the motorcycle gear you decide to wear because other than your gear you have little protection around you. It is entirely up to you to get to your destination safely. You have to be very smart and careful at all times, keeping in mind that intersections are the most dangerous places for motorcyclists. The good news is that most motorcycle injuries are minor, but the bad news is some accidents can change your life forever. I have no stats on how much safer a bus is over a motorcycle but according to the DOT riding a motorcycle is 33 times more dangerous than driving a car. One very important point is that motorcycles win out in terms of giving you the freedom to go where you please. You are no longer a slave to the bus schedule or full buses. This is a huge time saver, and planning your day just became easier. Gone will be the strong smells of an over-crowded bus, to be replaced with fresh air (most of the time). You also get the enjoyment of riding a motorcycle. There is good reason people ride motorcycles despite the risk. Riders feel connected with the road and the technical aspect of riding is rewarding. You’ll also become a better car driver as a motorcyclist because riding a motorcycle makes you more aware of your own driving skills and the (sometimes terrifying) lack of skilled drivers on the road. Both riding a motorcycle and riding transit come with a long list of pros and cons. But you can also have the best of both worlds if your budget allows it: on rainy days, take the bus! Riding a motorcycle is also very social, whereas being social on public transit isn’t always well received. You’ll gain a new circle of friends riding motorcycles if you put yourself out there. A key to happiness is learning new skills and making social connections. If motorcycling is not for you then consider using your commute time wisely by listening to audio books and podcasts on the bus. Most podcasts are free, they have great content and fewer commercials than radio. Sources: https://kater.com/our-top-5-questions-about-commuting-in-vancouver/ & Toronto Board of Trade. USDOT.